After a positive NAMM Show, Nashville is the place to be to keep the momentum going. This mid-year gathering is very different than our winter show. It’s more relaxed, more intimate, where deals are inked and friendships rekindled. Summer NAMM is where we celebrate the independent dealers, and provide a launching pad for new, innovative exhibitors and products that everyone will be talking about. It’s where we help dealers learn new marketing techniques and prepare them for the fall and holiday selling seasons. 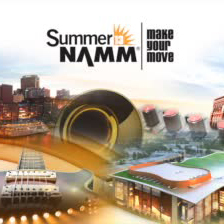 Being at Summer NAMM also exposes your brand and products to more than 300 media outlets. For many of our Members, Summer NAMM is the most cost-effective way to see thousands of their customers, schedule quality face-to-face meetings and book orders—all under one roof! Invest in your company’s future—make your plans now to exhibit at Summer NAMM. For more information, view the Invitation to Exhibit, learn about exhibitor options, access the space application and review the Exhibitor Manual.